A friend was in Ohio the day these were released, he snagged me two bottles. I wanted to love this beer but the rum sweetness was over the top, saccharine. I'll revisit this brew again - maybe my palate was off when I first tried it. There's a lot going on, wood, char, nuttiness - but the rum does a damn good job of masking those elements. Here we have an Imperial Stout that has seen a healthy duration of rum barrel aging with the company of walnuts, the rum character is pleasantly noticeable which compliments the massive stout character this brew brings to the table. The 11.5% abv does not show itself until about halfway through the glass, new subtle complexities with each sip. Finishes with suggestions of walnuts, floral alcohol, brown bread, mild molasses, and faint woody rum ... amazing. One of the best rum beers that I've had. Great mouth feel, well balanced, subtle but tangible rum notes. No head, pitch black long legs. Nose light, mild dark choc, cocoa and mild fluffy nougat, faint barrel notes. Taste sweet cocoa, caramel, aged dark malts, some rum and boozy notes, chewy dark caramel malts, fudgey cocoa, char, etc. Mild bitterness and earthy hop. 375ml bottle from the 2014 release. Poured into a snifter 11/19/2014. Holy rum. I am not a huge rum fan. A sniff from the glass after pouring smelled like an empty rum fith. It tastes great. If you like rum. It is a great beer. But I enjoy bourbon better. The bbaooa is much more balanced as well. Good beer, but I think Ill stick with the bbaooa. thanks to drlovemd87 for sharing another epic bottle that cant be bought in colorado! this is a neat one, and although i have never had the base beer for this, i have to imagine the rum barrel brings it to this elite level of quality and uniqueness. aromas of Caribbean spice meld with very dark roasted barley and the coffee notes that accompany it. i get a little dark chocolate, a heavy hit of vanilla bean, and a woody character thats earthy and has some minerals to it. very interesting. the taste of this one, and most barrel aged beers ive had from these guys, is a lot less about trying to pick apart the elements and analyse them, as it is just drinking and savoring the whole. 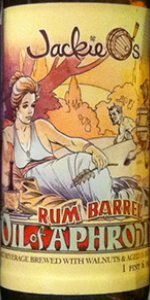 the rum influence is obviously heavy, but the flavors are integrated to a level not often seen, and its unfair to this beer to dissect it like i normally tend to do. the mouthfeel is just insane, a touch sweet from the rum, but velveteen softness and the viscosity of a good port wine. carbonation is minimal, but i dont wish for more of it. there is something delicate about this enormous beer, and thats tough to come by. jackie o has continued to blow me away, and i must now rank them with my favorite breweries in the country. this is next level stuff!